Meso-relle® 27G x 4mm/ 6mm/ 12mm (1pc.) Meso-relle® - Biotekne this Italian manufacturer, CE of medical needles, which are widely used in mesotherapy and other procedures. Meso-relle® needles are different length and different diameters. length: 4 mm/ 6mm/ 12mm; needle diameter: 0.4 mm; color: gray; ..
Meso-relle® 30G x 4mm/ 6mm/ 12mm/ 25mm (1pc.) Meso-relle® - Biotekne this Italian manufacturer, CE of medical needles, which are widely used in mesotherapy and other procedures. Meso-relle® needles are different length and different diameters. length: 4 mm/ 6mm/ 12mm/ 25mm; needle diameter: 0.4 mm; color: yellow; ..
Meso-relle® 31G x 4mm/ 6mm/ 12mm (1pc.) Meso-relle® - Biotekne this Italian manufacturer, CE of medical needles, which are widely used in mesotherapy and other procedures. Meso-relle® needles are different length and different diameters. length: 4 mm/ 6mm/ 12mm; needle diameter: 0.4 mm; color: blue; ..
Meso-relle® 32G x 4mm/ 12mm (1pc.) Meso-relle® - Biotekne this Italian manufacturer, CE of medical needles, which are widely used in mesotherapy and other procedures. 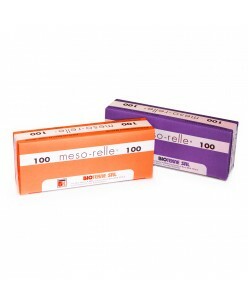 Meso-relle® needles are different length and different diameters. length: 4 mm/ 12mm; needle diameter: 0.4 mm; color: pink ..
Meso-relle® 33G x 4mm/ 12mm (1pc.) Meso-relle® - Biotekne this Italian manufacturer, CE of medical needles, which are widely used in mesotherapy and other procedures. Meso-relle® needles are different length and different diameters. length: 4 mm/ 12mm; needle diameter: 0.4 mm; color: green; ..